Jim Mallinder is hopeful that Dylan Hartley will make a swift return from the head injury that kept the England skipper out of Saints’ win over Harlequins on Sunday. Hartley was knocked unconscious in England’s win against France on March 19, later admitting that he didn’t remember lifting the Six Nations trophy. 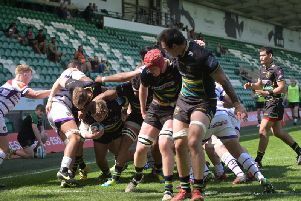 Mike Haywood again started and starred for Saints in the 29-23 victory against Quins, with Reece Marshall emerging from the bench for the final minute. But Saints will hope Grand Slam-winning star Hartley can be available to help carry the load as the club face a defining run of games. Mallinder’s men have a Champions Cup quarter-final at Saracens on April 9 sandwiched between crunch Aviva Premiership clashes with Wasps and Leicester Tigers. And when asked whether Hartley could feature at Wasps on Sunday or whether he would be out for a few more weeks, Mallinder said: “We’re hopeful about Dylan. “He’s been around the place and he looks in a good place. “He’s looking good, he’s done a few appearances and we’re hopeful he’ll be back sooner rather than later. “You’ve got to be sensible about it and it’s just about how he feels. Saints were forced into a few changes during the win against Quins, with Lee Dickson, Luther Burrell, Jamie Gibson and Kieran Brookes among those coming off at various stages. But Mallinder said: “Luther and Lee Dickson just got bangs to the head.